Marvin Miller, former executive director of the Major Leage Baseball Players Association, died today at the age of 95. 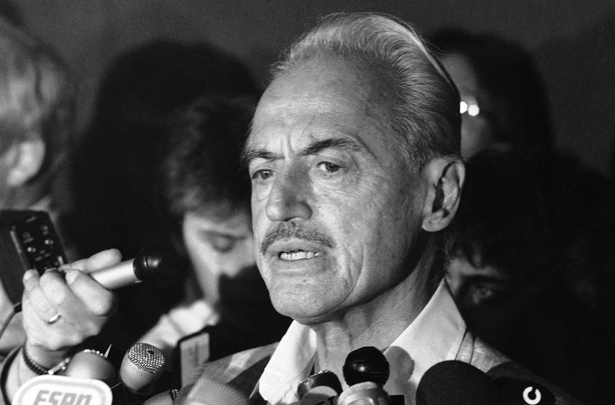 Marvin Miller, the legendary leader of the Major League Baseball Player’s Association, passed away today at the age of 95. Mr. Miller never played the game, but he may have had more influence on baseball than anyone else in this half of the century. As executive director of the Players Association from 1966–82, he brought a world of experience garnered in the tough steelworkers’ union to bear on baseball labor relations, and his knowledge, organizational ability, and resolve completely overmatched the owners and their representatives. During his tenure the average players salary increased from $19,000 to over $240,000. Today the Baseball Players Union is acknowledged as one of the strongest labor organizations in the United States. Below is my 2004 interview with Mr. Miller, and at 87, you will see that he still had the fire. Dave Zirin: Who or what shaped your thinking as a young man? Marvin Miller: Well, I guess a big part of what shaped me was that I entered high school in February of 1929. Several months later, boom, we have the Great Depression. All through the early 1930s my father, who was a retail store salesman, saw the businesses that employed him went downhill and all through the Depression, my father got more and more anxious and concerned and I was old enough to be aware of all of that. How did the Depression affect where you grew up? I grew up in New York City and in that period, you couldn’t help but observe the breadlines, the increase of the number of people begging in the streets, the people selling apples. The signs of economic hardship were easy to see. I am reminded of a question I was asked a couple of years ago. I was speaking to a group of young black students in New York talking about the Depression, breadlines and so on and one of the kids asked me if there were white people also on the breadlines and selling apples in the streets. Of course! In fact, most of them! In the New York of the early 1930s there was a black population, but it was largely ghettoized in Harlem and unless you went to Harlem, you didn’t see black people on the breadlines. How did the Depression move you toward trade union politics? My father who had never been in a union in his life, became active. He was a member in the wholesale clothing workers’ union in lower Manhattan and I have a very early memory of going to a store where he was working and finding him on a picket line. Also my mother was a teacher in New York City Public Schools and she became one of the early members of the city’s teachers’ union. As the thirties progressed and the CIO [Congress of Industrial Organizations] and industrial unions formed, everybody was aware of the ferment of the labor movement. All of these were influences. When did you personally become involved? Were you a baseball fan before your work heading up the Players Union? Oh yes. I was an old Brooklyn Dodgers fan and I was going to Ebbets field by myself by the time I was 10, when there was a Saturday double header! I was a huge fan from way back. How were you recruited to head up the Baseball Players Union? The players had a search committee made up of three or four players including Robin Roberts, Jim Bunning [two pitchers in the Hall of Fame], and Harvey Kuenn. Roberts was really the sparkplug of that committee and what he did was call [former chairman of the War Labor Board] George W. Taylor and he recommended me. What were the players looking for in you? They had an organization—a fake union—called the Players Association that had been formed by the owners. This was a company union in every sense of the word, the employers had formed it back in 1947 as basically a response to two things. One, there was a drive to organize players into a union, and two, there had been an attempt by two wealthy Mexican businessmen to start a major league in Mexico and they offered larger salaries. That was also the year of Jackie Robinson coming to the dodgers and the year of a man on his own trying to organize the players. A man named Robert Murphy went from Spring Training site to site—and the owners saw this and said we need to head this off and form a company union. Why were the conditions so ripe for a strong union? I don’t know that they wanted a real union [at first]. If I had to make an educated guess, the one thing the players had which they prized was their pension plan. It was called a benefit plan, That had been put into effect also in 1947, once again the owners saying, Let’s do something to prevent the union here. Eighteen years later, two things were concerning the players. One was that the pension had not kept pace over eighteen years of progress, also they picked up strong rumors that the owners were wanting to change it. Television by 1965 had grown tremendously. [LA Dodgers owner] Walter O’Mally saw this and wanted to after the benefit plan. But beyond that I was also learning that it was like pulling teeth learning what else made them unhappy. This was because they were a workforce basically unschooled in working conditions. They had all undergone a bunch of brainwashing that being allowed to play major league baseball was a great favor, that they were the luckiest people in the world. They were accustomed never to think, “This stinks. We need to change this.” You have to remember baseball players are very young and with few exceptions have no experience in these matters. Did the other movements of the 1960s, the civil rights struggle, the anti-war struggle, had on giving people the confidence to think union? There is no doubt there was a major connection. You now had a great many black and Latin players. You now had a much more diverse sampling of the American people than in the 1940s. You now had at least some people who were able to think in terms of what was wrong with the society, what was wrong with the conditions, people much more accustomed to think about these things. You have to remember before 1947, the ballplayer came in tremendous proportion from rural areas rather than from cities, from the south and southwest and not from big urban areas. And by and large from anti-union areas. Why was Curt Flood the player who stepped forward to challenge the reserve clause? To me Flood epitomized the modern player who began to think in terms of union, to ask questions like “Why is baseball an exception to how labor is treated in other industries? Why should we be treated like property? Why should we agree to have a reserve clause?” Basic questions that had gone unasked. Was it related that it took a black player to challenge the reserve clause? How did Curt Flood come to decide to file this lawsuit? Curt Flood came to me to discuss the possibility of a lawsuit and I thought that it was a losing case, the chance of winning was terrible. How was he going to finance it? I felt that he would indeed need help, and I was concerned how easy it was to make bad law with a bad case—and I felt the union should back him. And I began to lobby his case with the executive board and since we were going to meet in early December 1969 in San Juan, I arranged with Curt to have him come to the meeting, and have Curt be questioned, and when it came time to bring Curt in, I had already briefed him, and maybe some of them knew Flood but not in this context. I brought him into the board meeting and turned it over. And finally a board member asked Curt, “The motivation here: why are you doing this? Was it—to attack the reserve clause to stop the owners from trading a player where he didn’t want to go? Or was this a sign of ‘black power’?” And Curt looked at him and said, I wish it was, but we are dealing with an issue that affects every player. Color has nothing to do it. We are all pieces of property. Does Curt Flood belong in the Hall of Fame? Absolutely. No doubt about it. Is there still a need for a strong union? Yes! I have seen good conditions go bad. I think in labor management relations there is no such thing as standing still. You either move foreword or you go back. There is no standing still. Are salaries wonderful? Yeah, but we must remember that it is unity and solidarity and the struggles of the past that made them successful. There is no guarantee that this will continue. And without a union as successful as it has been, I would predict a downward spiral. The labor movement never stands still. Dave Zirin writes about sports for The Nation. Check out his blog here.